With 565 municipalities in New Jersey - boroughs, villages, towns, cities, and townships - it's a generally accepted convention to drop the municipal identification without fear of confusion. Paulsboro Borough becomes Paulsboro. Cherry Hill Township goes by Cherry Hill. Woodbury City drops the City. "We're Township," Angela Donato, vice president of the township council, said proudly. Growing up, the 2007 graduate of Washington Township High School noted, "you didn't have to say I'm from Washington Township. You just said, 'I'm from Township.' "
Some say it's a well-established colloquial reference indicative of the township's prominence; others might call it a sign of pomposity by a municipality of about 49,000 residents that bills itself as a "premier community." Either way, many locals seem to buy into the oral tradition, which shows no signs of wavering: The township's schools and athletic teams have embraced it as a point of pride, and even the municipal website is accessible at townshipnj.com. In many ways, though, the expression remains a linguistic head-scratcher - a reference whose origins aren't entirely clear and that residents tend to use unwittingly. "I never gave it any thought," said Joan Michael, the township historian who has lived there since 1956 and whose family laid roots there in 1789 (before the township was officially incorporated in 1836). "People here in the township just call it Township. It goes without saying that we're talking about Washington Township." Yet the nickname commands understanding beyond the township's 23 square miles. "If somebody in Deptford came to a meeting and they said 'Township,' I would assume Washington Township," said Paul Medany, mayor of neighboring Deptford Township. "I personally don't do that." County Superintendent of Elections Stephanie Salvatore said she routinely receives calls from Washington Township residents who make inquiries about matters in "Township." "I know immediately," Salvatore said. "I just kid around . . . get them to say Washington Township." "I don't get that from any other voters in other townships," she added. Washington Township has its purists, too. "To me, it's Washington Township," Council President Michelle Martin said, noting the formality provides clarity. "Why isn't Gloucester Township Township? That's a township." Bob Haines, a Washington Township native who was part of the high school's first graduating class in 1966, said residents didn't use the shortened name when he was coming of age. As the township developed from a farming community and the school grew, he said, so, too, did the nickname. "So many people [use] it," he said, that he now does. Township business administrator Bob Smith said he believed "a lot of the people beginning in the '70s, coming from Philadelphia, had - for lack of a better term - a sense of specialness. I think that was the motivator in coining the term Township as opposed to Washington Township." Smith, a former state assemblyman, said the term was a "very long tradition" and one known regionally, but one he likely wouldn't have used in Trenton. "It does potentially have the ability to make others feel uncomfortable or inferior," he said. 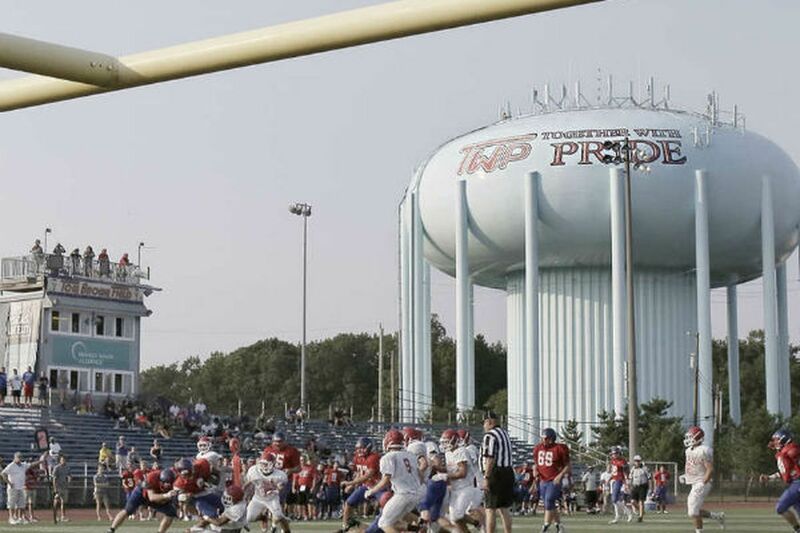 In 1988, the high school's football helmets were emblazoned with the letters TWP, an abbreviated form of the nickname and a moniker "that really took that whole notion to a whole new level," Superintendent Joe Bollendorf said. "Once that TWP logo hit, it caught on" even further. Bollendorf said the use of Township was pragmatic: "There are a lot of Washingtons." It could refer to an additional four townships in New Jersey with the same name (or a Washington Borough). Or the state. Or D.C.
"It's not practical nor is it accurate to simply say Washington," he said. Bollendorf moved to the township from Philadelphia the same year the new helmets hit the field, he said, but had known it as Township for years prior as he coached soccer in Millville, Cumberland County. Many say the schools and sports programs - as well as competitors from surrounding communities - have been key to the nickname's longevity. Some years ago, Washington Township schools also began using its abbreviated form as an acronym for "Together With Pride." It's not uncommon for townspeople to use the motto and trumpet the phrase "We are TWP," as if the municipal equivalent to Pennsylvania State University's rallying cry. Township resident Jackie Levesque in 2011 created a Facebook page for community news and events and, fittingly, called it "Township Talk." People who visit the page (it's logged about 11,000 followers) know it's for Washington Township, the 15-year resident said. "It's a term of endearment," she said. "That's what it means to me, anyway." Donato, the council vice president, said the nickname gives the town a sense of unity, of purpose. "There's a lot of us but we're a whole big family," she said. "I think Township - that carries something." That's not to say it's always necessarily received warmly. "When our kids go off to school, they'll go off and be ribbed by other kids for referring to our town as Township," said Bollendorf, the superintendent. "What's funnier is that, when you say it, most people know exactly what you're talking about."